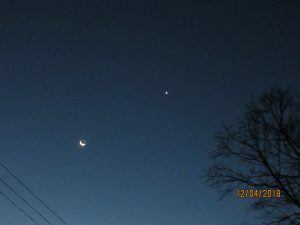 Home→Venus at Dawn–at its Brightest in White Plains New York, USA–Did You See Her? Venus at Dawn–at its Brightest in White Plains New York, USA–Did You See Her? It looked like a plane, or a flying saucer, she was so bright this morning adjacent to the crescent moon looking southeast as the dawn emerged. It is the regal planet Venus. Venus, traversing its orbit is now between the Earth and the sun, which began to move out of the night sky and into the morning sky on October 26, 2018. This diamond in the sky this morning now assumes its traditional name as “The Morning Star”. In early December it is in its most brilliant formal gown. Tomorrow if it is as clear as this morning, it will be visible if you look into the direction of the dawn. You’ll the “Goddess of the Skies gleaming in the east, one hour before sunrise. ou’ll easily see Venus blazing away in the east an hour before sunrise and even after the sun rises. The universe is awesome in its serene mysteries. The planet Venus is the third-brightest celestial body to light up our sky, after the sun and moon.